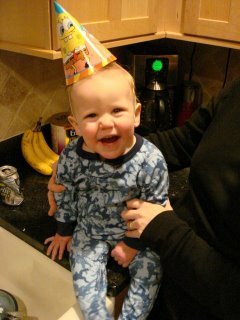 Well Mr. Finnegan: It's hard to believe that you are almost one. You have charmed your way into the hearts of the entire Cummings Family. (Especially the big guy David since you share a birthdate!) I hope you have another wonderful year full of exploration and excitement. You are such a great little dude and we wish you a wonderful first birthday! You sure bring alot of joy to everyone you meet!Have a great day. So glad to see you are following in the tradition of the extended birthday celebration - your mom has taught you well. We wish we could be there to celebrate with you on the 31st, but we are thinking about you and send you lots of love and best wishes for the next year. Happy Birthday! We really enjoyed meeting you in October. You are a wonderful little boy. Your second year of life will bring even more adventure - for mom and dad too. Enjoy your cake and presents! and may He bless you in the year ahead.